Take it or Leave it | Listen Free on Castbox. Being a parent is the toughest job on the planet. Nuff said. Join us each week for an hour where we will discuss all things marriage, motherhood, and everything in between. We will take live calls from real Moms across the globe and give our advice-ish answers to all of your burning parenting questions. Remember, you are not alone. We are here for you! Take it or Leave it Season 2 is brought to you by Grove Collaborative. Visit http://grove.co/takeit and grab your FREE $30 gift set. This week we have Principal Gerry Brooks and we look at the four things parents of successful kids do, debate the use of iPads in school and discuss the new version of coparenting. Take it or Leave it Season 2 is brought to you by Grove Collaborative. Visit http://grove.co/takeit and grab your FREE $30 gift set. This week we have Bethany and Amanda form Who Wait Walmart and we look at the ridiculousness that is a 9 month pregnant mom getting a citation for her kid peeing, we provide some insight into the head of a different needs mom and see if the zodiac has our relationships right. Guest Hosts Whoa, Wait Walmart - We Ask if Your Kid Has Peed in a Parking Lot, How To Have a Relationship With a Different Needs Mom and If You Married Your Sign? Take it or Leave it Season 2 is brought to you by Grove Collaborative. Visit http://grove.co/takeit and grab your FREE $30 gift set. This weeks we have guest host Crystal from Money Saving Mom and we discuss some safety tips for women travel like g alone, we dive into the body image feud on social media and Meredith shares her spicy movie list for date night. FYI, it was a disastrous list. Take it or Leave it Season 2 is brought to you by Grove Collaborative. Visit http://grove.co/takeit and grab your FREE $30 gift set. On this weeks episode of take it or leave it we review the new FDA approved postpartum depression treatment that we can't afford, chicken pox parties and ask if we really parent as a team. Take it or Leave it Season 2 is brought to you by Grove Collaborative. Visit http://grove.co/takeit and grab your FREE $30 gift set. On this weeks episode of take it or leave it we look at the "Varsity Blues" college admission scandals that rocked our worlds, observe the evolving role of helicopter parents and wonder whether we honeymooned wrong. Take it or Leave it Season 2 is brought to you by Grove Collaborative. Visit http://grove.co/takeit and grab your FREE $30 gift set. 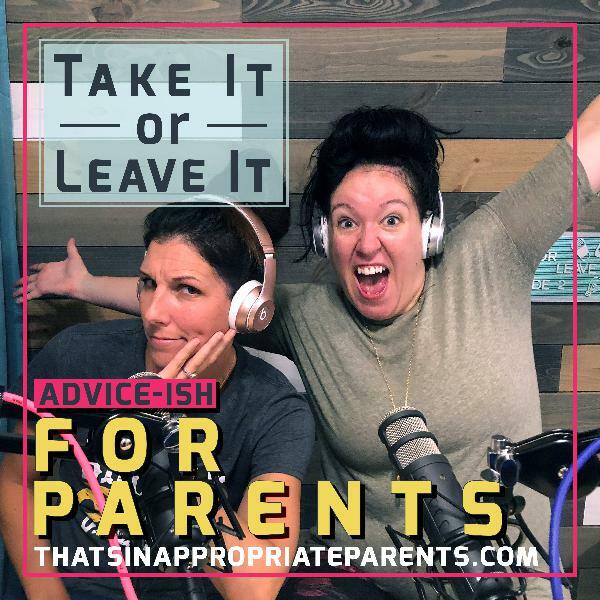 On this weeks episode of take it or leave it we look at the major parenting hot button topics and jump right in to uninvolved grandparents and in-law issues. Take it or Leave it Season 2 is brought to you by Grove Collaborative. Visit http://grove.co/takeit and grab your FREE $30 gift set. On this weeks episode of take it or leave it, we tackle big life fails! It’s important to talk about the disappointments in life, as they are part of what makes us who we are. Take it or Leave it Season 2 is brought to you by Grove Collaborative. Visit http://grove.co/takeit and grab your FREE $30 gift set. On this weeks episode of Take it or leave it, we discussed that there is in fact, no such thing as a free lunch. What age is appropriate to leave your children home alone, and how to keep it spicy, like the Oscar performance between Lady Gaga and Bradley Cooper. Take it or Leave it Season 2 is brought to you by Grove Collaborative. Visit http://grove.co/takeit and grab your FREE $30 gift set. On this weeks episode of take it or leave it, we chatted about Meredith origin story. Why and how she started the That’s Inappropriate community. Take it or Leave it Season 2 is brought to you by Grove Collaborative. Visit http://grove.co/takeit and grab your FREE $30 gift set. On this weeks episode of Take it or Leave it, talked professional sleep coaches for babies, puberty and asked if Valentine's Day is a crock of crap or not. this still isnt loading really wanted to listen!! I had one chicken pox when I was a baby. ONE!! I've had shingles in my eyes 4 times now. I have heard of the chicken pox parties. Mostly when I was a kid but my mom didn't participate. FYI There is a musical based off Ground Hogs Day. As per the comparing your children to others, it drove me crazy when some family members insisted that my sons aren't doing things right or "on time." It's hard enough parenting without someone telling you that you're not doing enough. ❤ this podcast. was anyone else having problems with this not loading? Also you ladies are sooo awesome!!!! I can't wait to see your shows!!! Both sets of grandparents live close to us but neither have much to do with our kids. my mother I can understand she does daycare and has other peoples kids all day so I get why she doesn't. My husband's parents are another story. They are both retired and have only kept our children a handful of times the whole lives. My oldest is 11. My husband's mom also keeps his sisters kid ALL THE TIME!! It is soo frustrating because my kids are good respectful kids. Any time they stay some where I get nothing but compliments about how good they were. So it is really hard to understand but I have finally realized I can't beat myself up about it. The kids will know when they are older that we tried and that it didn't fall on us. screw those bad reviews you gals rock!!! I love this podcast! These are things we all deal with as parents in our own way and you two discuss in such an honest and transparent way! Thank you for ripping the mask off of the "perfect social media parent"! You ladies are awesome! love your face, Tiffany!! love you guys!!! You make my mondays worth it and full of laughs and understanding! I have 3 bonus girls 6, 14, 16. About to start IVF after trying for 6 years. Your IVF podcast was awesome and would love to hear more! how do I find these when y'all are live? I only ever see them afterwards. I love your jokes Tiffany!! I share them with my family every week! No worries on the bed wetting. Normal until about age 10. Good nights are a life saver!